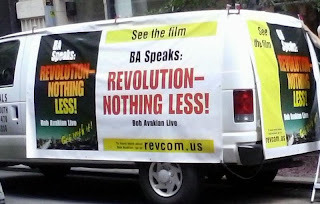 August 9, Friday, 7 p.m.
Planning meeting for the next “Revolution – Nothing Less!” van tour in the Bay Area and surrounding cities. This is a time to step out and step up with the Revolutionary vision and framework developed by Bob Avakian, especially taking out the film, “BA Speaks: Revolution – Nothing Less! and BAsics, from the talks and writings of Bob Avakian. We'll talk about how the van tour can have a great impact, involve lots of people and raise funds to make this known. Bring your ideas and energy.